Last week, fellow volunteer and National Youth Orchestra of Jamaica‘s Executive Director Karen Prentice got a terrible shock. 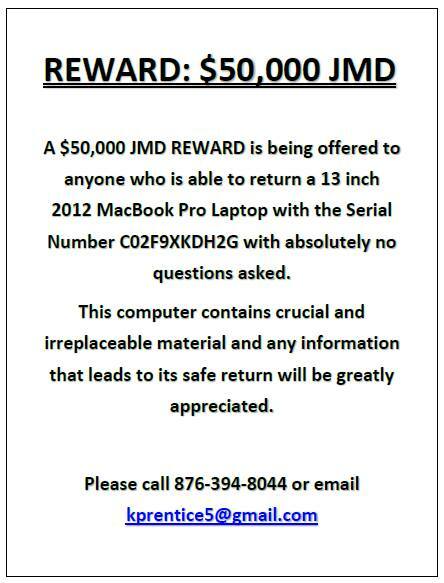 Her Mac Pro was stolen from a room at Kingston College where some NYOJ members were practicing. It seems a man, whom many people did not recognize, was hanging around and saw an opportunity. He was seen putting something in a box, presumably Karen’s computer, which had been under the care of a colleague while she took pictures of some new music stands. The NYOJ is doing some wonderful work: they recruit high school students from tough, inner-city communities, who want to learn how to play a musical instrument. Through this experience, they also learn the intangibles like discipline, dedication and how to work as part of a team. They are also exposed to a curriculum that is not readily available in most Jamaican schools. Karen immediately filed a report with the police, but they say there’s not much they can do because there is no picture of the individual, despite two eye-witness accounts of the suspect. The security cameras at the school are broken, of course, and the security guard says he saw nothing suspicious. The reward is being offered in the hopes that someone will return the computer, no questions asked, and these precious documents and memories will be returned to Karen. However, in reality, the computer has probably already been sold for a small sum. Please share this post widely, perhaps we can recover these precious memories.